When Conan O'Brien was fired by NBC this winter, many people thought he would be on TV again soon, but not on TBS. 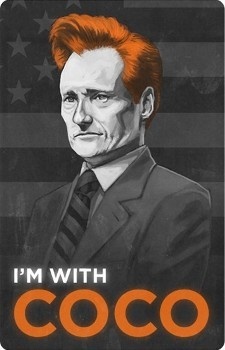 Conan O'Brien is not going to Fox or even Comedy Central. He instead will be appearing on TBS (Turner Broadcasting System) as early as November. The potential deal with Fox soured when it was clear that the network wasn't going to let O'Brien own his show. TBS was ready to play ball, however, offering a reported 8 figure deal and complete show ownership. O'Brien was initially reluctant to bump George Lopez from his 11pm EST time slot, like Leno did to him this year, but was persuaded when the Latino comic called him personally to urge him to come to TBS. The new show will be based in Los Angeles and run on a four show per week schedule similar to Jimmy Kimmel. O'Brien begins his live national comedy tour today in Eugene, Oregon. "In three months I've gone from network television to Twitter to performing live in theaters, and now I'm headed to basic cable," O'Brien said. "My plan is working perfectly." I sincerely believe that delaying The Tonight Show into the next day to accommodate another comedy program will seriously damage what I consider to be the greatest franchise in the history of broadcasting. The Tonight Show at 12:05 simply isn't The Tonight Show. Indeed, it would be the Tomorrow Show. All I ask is one thing, and I'm asking this particularly of young people that watch: Please do not be cynical. I hate cynicism, for the record it's my least favorite quality. It doesn't lead anywhere. Nobody in life gets exactly what they thought they were going to get. But if you work really hard and you're kind, amazing things will happen. I'm not sure if moving to TBS is exactly what he had in mind, but it sounds like he will have the creative control and the compensation to more than make up for the rough year that he's had. The good news: I will be doing a show on TBS starting in November! The bad news: I'll be playing Rudy on the all new Cosby Show.